If you are looking for a way to unwind, spend some quality time with your family/friends or have a “romantic getaway” then there is no better place than the awe inspiring beauty of the Smoky Mountains. Days Go By Cabin offers you an opportunity to experience one of the best views nature has to offer from the Hot Tub Deck of a Cozy and Beautifully furnished Loft Bedroom Cabin. Although the Smoky Mountains is world famous for its fall season, it is also spectacular during spring, summer and winter. And when you are ready to tear yourself away from your front row seat anywhere on the deck, the cabin has been furnished with your comfort and needs in mind. You can enjoy a meal you prepared in the fully equipped kitchen, take up a book in front of the wood burning fireplace, soak in the whirlpool bathtub or lounge in bed taking in the landscape through the huge windows…and that is just a small list of the amenities available to you. We all need more time like that either to ourselves or to spend time with our special someone’s. If you do feel like you need to get out for some activity, you are only 10-15 minutes away from all that Pigeon Forge, Sevierville and Gatlinburg have to offer…hiking, biking, antiquing, restaurants, family fun centers, and don’t forget Dollywood! Days Go By is the second of our family's privately owned personal vacation cabins and is just as highly valued as a home away from home as the first. Therefore, it has been upgraded, furnished and maintained at a high level of quality and care. This cabin is nothing less than an investment in our own happiness and yours. We waited for just the right cabin to come along that I could be as proud of owning and sharing as my first and I have no doubt that is what we found. We wanted to make this amazing experience available to other people like us who just need a way to relax, recover, reconnect and take in the beauty of nature. I am sure you will come away feeling the same way I did the first time I stood on the deck and took in the surreal scene all around me. Days Go By is a One Bedroom Loft floor plan with Two Bathrooms which includes a whirlpool bathtub and Hot Tub. It is fully furnished with an upscale modern rustic style. The Loft Bedroom provides an attached bathroom, a Queen size bed, dresser, nightstand, and television…not to mention the view. There is a full kitchen with all the basic necessities you would need to prepare meals in addition to a dining table for four and an outdoor barbeque stand if you prefer to cook outdoors. There is a loveseat sofa and recliner chair that lets you kick back and enjoy the wood burning fireplace and HD cable television. The wrap around deck comes with rocking chairs, outdoor eating patio set and swing…and of course the Hot Tub. The cabin provides central air, modern water filtration, a DVD player, video game machine, and free WiFi connection. The cabin has a private driveway that will provide ample parking private parking. Although Days Go By already stands out above the rest just the way it is, I also have plans to continue to upgrade it more and more in the future. And, in case this might be an option that works for you, Days Go By is also just a few doors down from my other cabin, Riser’s Ridge (ID 643381). The close proximity of these cabins gives my guests a perfect opportunity to travel with other friends and/or family; each of you getting to enjoy your own private retreat, but be a short walking distance to reconnect. In the event that you are curious where Days Go By Cabin got its name, it was named after a favorite and very appropriate song…Days Go By from Keith Urban. I am a life long California resident. I discovered, and fell in love with, the Smoky Mountains immediately as I explored the United States planning for retirement from law enforcement. I just had to have a place to call my own and to return to and Riser's Ridge was that place. Days Go By was a recent addition because my family has truly enjoyed sharing this experience with our guests and it was an opportunity a stone's throw away that we just couldn't pass up. I, and my family, deeply love the beauty of nature and appreciate the sense of peace and rejuvenation it offers from the every day grind of life. Days Go By Cabin was purchased because, as with our other cabin Riser's Ridge, it has a view that can't be given justice by any words or photographs. It must be experienced fully first hand. It is a fun and cozy little cabin that we just fell in love with, wanted to be able to visit ourselves, and make available to other like minded people who also appreciate a wonderful experience. And even if I do say so myself, I know you won't find better guest care. 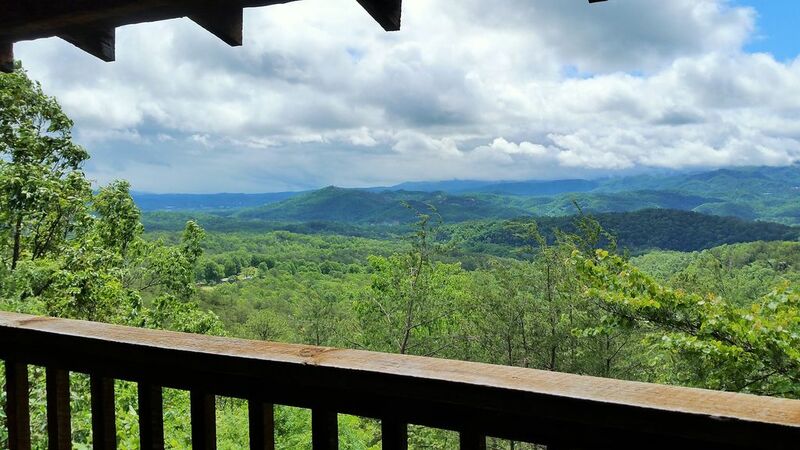 Days Go By Cabin undoubtedly offers you a front row, deck side, view of one of the most breathtaking panoramic views you can find in the Smoky Mountains; putting on display the best that nature has to offer during each season. In addition, we have taken great care to present our cabin at a high level of care and comfort with a rustic yet modern décor. We have prepared this cabin for our guests with nothing less than the quality and integrity that we would want. We want you to know that we truly care about your stay. Central A/C provided. Ceiling fans. Central heat provided. Wood burning fireplace. Guests are provided with Bed Linens and pillows. Extra blankets are available and a cozy throw for relaxing on the couch. Wood burning fireplace. Guests will need to provide their own firewood. Firewood is easily obtainable from the area stores/markets. Private asphalt driveway with ample space for (2) vehicles. Free WiFi connection provided for your electronic devices and so that you can access all your favorite TV/Movie streaming Apps/Accounts via the HD television such as Netflix, Hulu, etc. Guests are provided with bath towels, hand towels, face towels and bath sheet towels for the Hot Tub. Brand New (Nov/2016) Cozy Couch with Queen Sleeper Pull Out Bed. A mattress topper is also provided for the Sleeper upon your discretion. Small dishwasher provided or there is also the option of hand-washing and using the drying rack provided if you prefer. Dish towels provided. Full size apartment size refrigerator/freezer. Ice trays are provided. Four burner electric stove. Pots/Pans provided. Electric stove includes oven. Pizza pan provided. Full size coffee maker provided. Does require standard round filters. Guests will need to provide all the food supplies they will need/want. There is salt/pepper provided and whatever spices other guests may leave to share. Complete set of dishes, utensils, and glassware provided. There is also a cutting board and knife block. Kitchen items are newly replaced and will be replenished often to maintain a high standard. Full Size (apartment style) Kitchen with all the basic amenities to cook your own meals. Dining table with stool style seating. An outdoor patio table and outdoor plates/cups are also provided so that you can enjoy your meals on the deck. Flat screen HD televisions provided in the Living Room and Netflix, etc. accessible in the Loft Bedroom. Basic Cable provided; premium channels may be available depending on the current service plan. Bluetooth Speakers provided so that you can stream music via your electronic devices. The speakers are wireless and can be moved about to suit your needs. A standard radio/CD player also available. DVD/Blu-ray players provided with each television. Xbox with small library of games provided with the Living Room television. Deck is furnished with Rocking Chairs, Hot Tub, Patio Dining Table and a Swing Bench. Beautiful view and we had the best time away! Stayed in the mountains for vacation a couple times now. This was a little different. Our view was amazing! It was peaceful and quiet! Neighbors weren’t loud and partying. It was just a great couple days. It was a nice getaway, had everything we needed at the cabin for cooking and relaxing. I Have absolutely no complaints! Great time spent there! Will be back! We had a delightful week in the Smoky Mountains and loved the location of the cabin. It was clean, well-appointed, excellent wifi connection, hot tub on the deck and a fireplace indoors. Nice location with easy access to the mountains and to the airport in Knoxville...away from the busyness of Pigeon Forge and Gatlinburg though one can easily get there from here. I would recommend as a wonderful place to stay for a couple. Neat little cabin. And I understand there’s an amazing view. Unfortunately, it was rainy with low, low clouds the whole time we were there so we never saw it! Place was clean, well equipped, very private, and the hot tub was great! Would definitely go back. Great Cabin with an Even Better View! We have stayed at several cabins in the Smokies and Days Go By has been the best so far. We stayed three nights over the Valentines weekend, the weather wasn't the best, but the cabin and hot tub made up for it. When ever we look for a cabin, the hot tub and the location/view is the first priority. This cabin was perfect on both accounts. After a "home cooked" dinner every evening, it was out to the hot tub for wine, moonshine and relaxing. After breakfast every morning, it was out to the hot tub for sunrise and Mimosas! The view in the summer and fall would be even better. The location was great as well. Just a short drive into town or over to Cades Cove, then back up the mountain to escape the craziness of the parkway. The cabin had everything we needed also. The kitchen was well stocked with utensils, pots & pans and basic spices. The stove and fridge are a bit older, they worked fine but are in need of replacement. We were told this cabin is next up for a remodeled kitchen, flooring and baths so it will be even better in the near future. While out on the deck or in the hot tub, you will feel like you are the only people up there. The cabins on each side can barely be seen and we never heard anyone else. The cabin can sleep 4 but it won't be comfortable. Maybe one or two kids could sleep on the sofa/sleeper but the cabin is perfect for two adults. Speaking of the sofa, it wasn't the most comfortable, so we only sat on it for coffee in the a.m. The recliner was the best! Amy responded quickly to any question we had and the management company was great as well. We highly recommend staying here and will be visiting Days Go By again in the future! Nice Work! Great cabin, private and just what I wanted. I've been staying in cabins near and around Piegon Forge for nearly 40 years, Days Go By was one of The nicer ones. I'll be back soon. Nearby to Family Friendly recreational city of Pigeon Forge famous for Dollywood.